The easiest way to think of a 5-channel amp is 2 amplifiers rolled into a single unit. Effectively, the 4-channel unit has an extra channel bolted on making it possible to power 4 speakers along with a subwoofer. This kind of amplification set-up is not for everyone but it’s a versatile solution that’s ideal for pretty much any application. Today, we’ll walk you through the 10 best 5-channel amps on the market so you can bring your car audio system fully to life and get that bass thumping. JL Audio always delivers when it comes to audio and this 5-channel amp is no exception. The HD series serves up a winning combination of power with unerring accuracy to bring your music fully alive in the car. The JL Audio HD900/5 is a wonderful 5-channel class D amp so you won’t be plagued by overheating even under heavy use. The stackable design means you can extract maximum firepower in a limited space and the units still stay cool. This agile amp pushes 100 watts of RMS power per channel to front and rear speakers and 500 watts to your sub from a single compact chassis. You’ll get very little intrusive noise thanks to differential-balanced inputs and sound quality is as crisp as you’d expect from JL Audio. For a well-built and versatile 5-channel amp, this deserves a place on any shortlist. For maximum power from an exceedingly compact 5-channel amp, Alpine’s bestselling PDR-V75 takes some beating. Power handling is first-rate and you’ll be able to drive a deep, rich sound to your subs and speakers with the absolute minimum of distortion. You can also harness a 3-channel configuration if that makes better sense for your system. 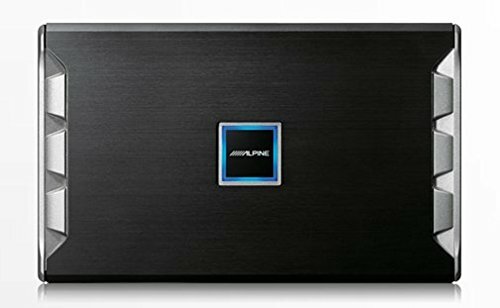 Alpine produce fantastic audio across the board and this nifty 5-channel amp with the option of using as a 3-channel sticks firmly to that tradition. It’s small but perfectly formed and, given the performance, not too pricey either. You’ll get 75 watts of RMS power to each of your 4 speakers and up to 350 watts to your sub which is more than enough grunt for most reasonable purposes. The sound is not just loud but extremely clear with almost no noticeable distortion. With a great deal of fine-tuning available, you can really customize this amp and it will work with practically any set-up you have in mind. 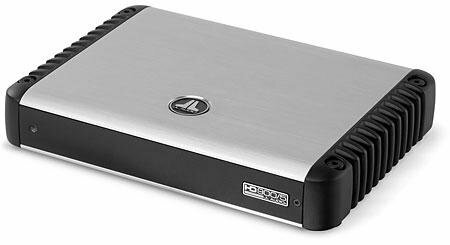 We can’t recommend this class D 5-channel amp highly enough. Rockford Fosgate dominate the car audio scene with just cause. The aptly named Punch 5-channel amp comes in a small package but the unit is capable of driving even high-performance speakers in fine style. 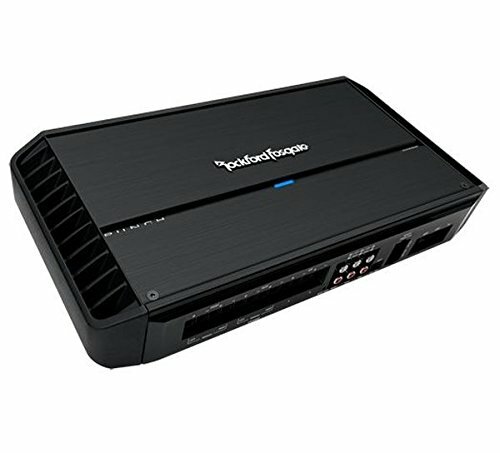 Rockford Fosgate’s enduringly popular 1000X5 can power your whole system with ease and you can use this amp in 5-channel or 3-channel mode according to your needs. RMS power is 75 watts for your front and rear speakers and an inspiring 500 watts to your subwoofer. In 3-channel mode, you can enjoy 250 watts RMS for each speaker with no reduction on power to your sub. The Dynamic Thermal Management System slashes the risk of overheating so you’ll get stable, dependable performance even when pushed hard. While it’s not exactly a giveaway, considering the brand heritage and build quality alongside top-notch performance, we’d argue this 5-channel amp is great value for money. If you’re on the trail of a high-powered 5-channel amp but you’re operating on a tight budget, the Rockville dB55 is a must. This class D unit will give your speakers and sub a distortion-free sound packing quite a thump. The 90-day money back guarantee lets you buy with complete confidence. 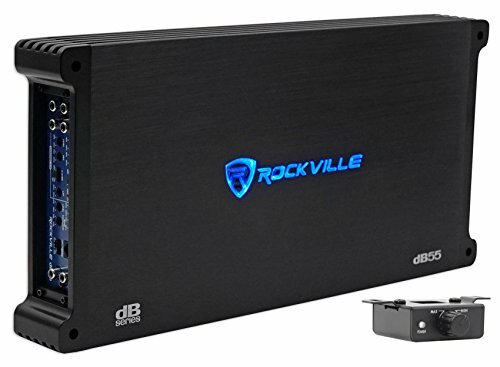 Like any class D amp, this Rockville runs relatively hot but, when you factor in the power and the price, it still merits a place on any list of the best 5-channel amps. Rockville provides several varied power handling ratings. The CEA-compliant version is 120 watts of RMS x 4 speakers at 2 ohms with 500 watts to your sub. You’ll certainly be able to drive even more powerful speakers without any concern. Build quality is solid and the components are built to last. While this is by no means perfect, for a budget 5-channel amp, you really can’t ask for much more. The Pioneer GM-D9605 is a capable and reliable 5-channel bridgeable amp from a brand you can rely on. Perfect for smaller vehicles like trucks or sports cars, you’ll get a big sound from a very small chassis. 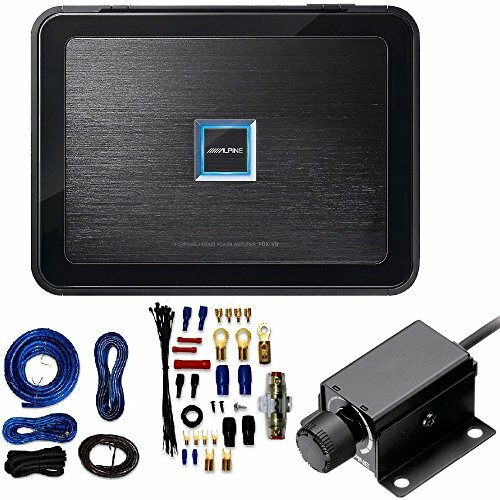 You get a great deal of flexibility with installation and this amp even works well in boats. 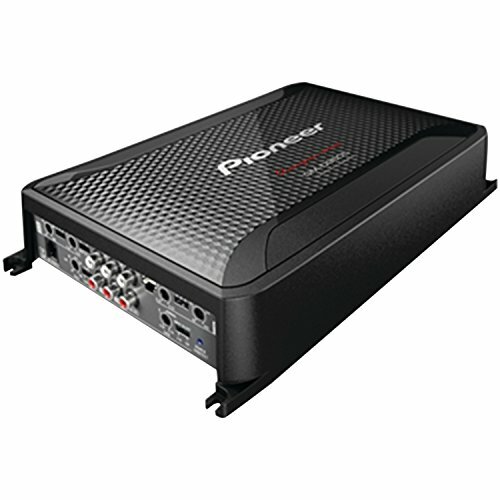 If you have a smaller vehicle where space is rather limited, this compact 5-channel amp fits into small spots without compromising power or sound quality. The variable low-pass filter means you can tweak audio frequency to mesh perfectly with your chosen sub. Power handling is surprisingly strong with a whopping 2000 watts of max power. The only real gripe with this 5-channel amp is more of a general complaint than anything specific to the model. Like all class D units, it can run hot if overworked so consider your usage habits and bear this in mind. 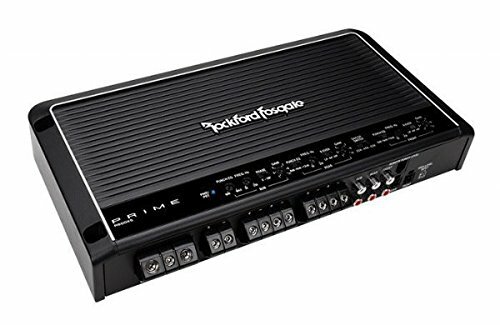 You know where you stand with Rockford Fosgate audio and, while this is not an mind-blowingly powerful amp, it’s a 5-channel that’s more than fit for purpose at a very keen price point. Also, what you lose out on in terms of volume, you’ll gain in crispness of sound. Most amps are either class A/B or class D but the R600X5 brings all 3 classes together to serve up a unique listening experience. The A class serves up the best pre-amp sound quality. Class B components are designed to lessen overheating while the class D delivers supreme efficiency. RMS power is 50 watts for each of 4 speakers and 200 watts RMS to your sub at 4 ohms. You can also bridge the amp if required for complete versatility. With a glut of internal protection, super-solid componentry and a great deal of freedom with configuration, this Rockford Fosgate is one of the best 5-channel amps at your disposal. For a basic and cost-effective 5-channel amp more than capable of powering a surround sound system, the Kenwood KAC-7005PS is a serviceable option. While you won’t be able to power really high-powered speakers without some overheating snags, for an entry-level 5-channel amp, the Kenwood delivers fully. Looks Like This Product Is Currently Sold Out. This Kenwood is by no means perfect but, considering the brand and very competitive price, it’s well worth further investigation if you have more modest power requirements and a standard-issue system. A class A/B amp, the Kenwood runs cool and you’ll experience a crisp sound even if the volume is somewhat lacking. RMS is a modest 40 watts per channel with 300 watts to your sub. If you’re looking for standout power, this is not the amp for you. If, on the other hand, you want a solid and dependable 5-channel unit in a very slimline chassis, the KAC-7005PS repays closer study. You can breathe life into a basic sound system with a decent range of flexibility without breaking the bank. Planet Audio’s strapline for this 5-channel Anarchy amp is to break the rules. If you’re looking for an amplifier that’s heavy on the power front and capable of driving 4 speakers and a sub with a great deal of customization available, the AC1800.5 is well worth including on your shortlist. 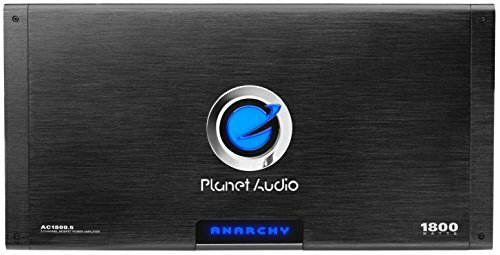 While, like most manufacturers, Planet Audio play rather fast and loose with their quoted power ratings, this amp is unquestionably capable of a solid sound. RMS is 225 watts per channel with 450 watts to the subwoofer at 2 ohms. You’ll be able to configure this amp tailored to your precise needs with bridge channels included. As the name implies, you’ll be able to bend those rules rather than being forced into a rigid set-up that might not be suitable. You might expect an amp with the power of this 5-channel beauty would eat up too much interior real estate but the kicker is that it comes in an incredibly small chassis for the win-win. Our penultimate 5-channel amp is another agile beauty from Alpine, the sleek and potent PDX-V9. With more of a focus on user-friendliness and straightforward installation than on raw power, this amplifier is perfect for beginners. On top of this, the stackable class D Alpine keeps everything running cool. Alpine have targeted this 5-channel amp squarely at those just dipping their toes into the car audio world. Rather than obsessing about power for its own sake, the premium here is placed on ease of use and Alpine has hit a home run for novices or anyone not so practically inclined. Power is still respectable enough with 100 watts of RMS per channel and 500 watts for the subwoofer. Alpine ensures the amp stays cool even if you want to get more ambitious and stack more than one unit. Dynamic Thermal Management adds to the cooling ability of this class D beast. Skar Audio manages to hit a number of crucial pain points with this 5-channel amp. It’s an optimized package of affordability, efficiency and power and worthy of the final place on our list of the 10 best 5-channel amps. If you’re looking for a bargain but you’re not prepared to sacrifice quality, check out the RP600.5 and you will not be disappointed. 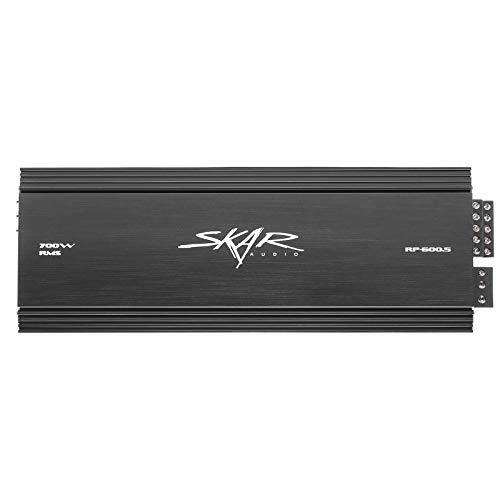 If you’re on a tighter budget but you still insist on a top-notch full-range 5-channel amp, Skar Audio’s hybrid class A/B and D unit is the obvious choice. This combination of the best of all classes results in an amp that can drive your whole system with maximum efficiency. You’ll get 60 watts of RMS power per channel at 4 ohms with 250 watts for your woofer. This is more than enough power for most requirements, especially considering the price point. With an impressive breadth of controls, rock-solid build quality and enough oomph to power your whole system, the Skar Audio RP600.5 deserves a place on any list of the best 5-channel amps. We very much hope this comprehensive guide to the best 5-channel amps has simplified your buying decision. If you’re just starting out in the car audio world and you’re not sure what to look out for when buying the best amp, check out our guide to help you with the basics. Come back soon for more valuable information about every aspect of your car, inside and out.